Azure, a chamfron within a bordure embattled argent. 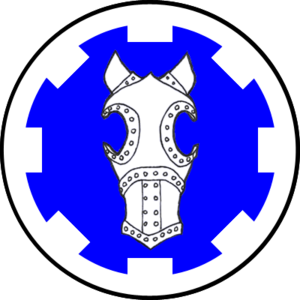 Companionship in the Order of the Chamfron of Caid is warded for superior skill and authenticity in appearance in equestrian activities. Bestow the title of Lord/Lady. Alternate Titles are available for substitution. Medallion strung on an Award Cord. The creation of the Order was proclaimed by Sven II and Kolfinna II firstly on 11/15/2008 at Calafia Anniversary, and secondly on 12/06/2008 at Queen's Champion Equestrian Tournament. Unto all Caidans, reading, hearing or seeing, We, Sven and Kolfinna, King and Queen of the Sovereign Realm of Caid, give you greetings. We hereby proclaim and create the Order of the Chamfron of Caid. Companionship in this Order shall be granted unto those equestrian artisans that the Crown deems meet the requirements for entry above said. This Order shall rank equally with the Order of the Dolphin, the Order of the Harp Argent, the Order of the Argent Arrow, the Order of the Crescent Sword and the Order of the Duelist, and may bear with it an award of arms. We acknowledge that alteration may be required to the name and/or armory of this Order prior to registration by the College of Arms of the Society for Creative Anachronism. Done by our hand this Fifteenth day of November, in the year of Our Society the forty-third which is 2008, Anno Domini. *The original badge design, as stated here, was returned by the Kingdom College of Heralds 11/14/2008. The newer design is the same, with the crescent removed. This page was last modified on 1 November 2009, at 11:52.